Box Dimensions (LxWxH) 4.0 x 3.5 x 2.0"
PG-240XXL Extra High Capacity Black Ink Cartridge is rated 4.8 out of 5 by 12. Rated 5 out of 5 by Rob_L from Good page volume Previous Pixma printer gave up the ghost - probably due to using non-Canon ink cartridges. Using these Canon catridges in the new printer and getting good page volume/print life. Print quality is good, too. Not archival for photos. 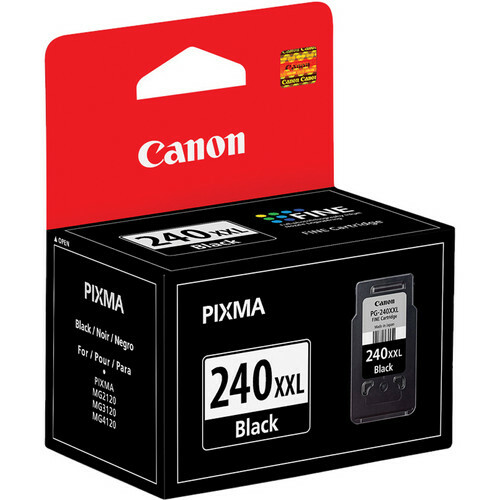 Rated 5 out of 5 by amateur photographer from Good value, Quick delivery I purchased this ink to have on hand when the black ink runs out of my printer, so have not yet installed it into my printer. The ink cartridge that came with printer seems to be going down rather quickly so buying the xxl size makes a lot of sense to me. I have always been impressed with the products and service at B&H and recommend B&H to all my friends. Rated 4 out of 5 by Pete 80 from PG0249XXL Can't really rate it yet but have used the PG-240XL and am just now running out. Trying the PG240XXL should give me a lot more page of just black ink. Don't use too much color so and XL last me a long time. Rated 5 out of 5 by Mr. Wonderful from Great Price, Fast Shipping Best price out there. Got it in two days. B&H has been around a long time, so you know it's not some fly by night Internet company. Rated 5 out of 5 by Ray from Perfect fit I use the printer at home every day and when I need ink I place an order with B & H and have it in 2 days at the best price. Rated 3 out of 5 by Christmas Shopper from A Necessity What can you say about ink? You do what you have to do. But B&H provided great service as usual. Rated 5 out of 5 by Chuck from Pixma inks B&H alway a great combination of great prices and fast delivery. Will the Canon PG-240XXL or PG-240XL work on the MG3520? As per Canon, yes it will work. My best suggestion is to always go the the copier manufacturers web page, lookup up your exact copier and you'll find ink cartridges under supplies and accessories . It lists all the ink cartridges that will fit, color and black/white. They also have anything else you'll need for updating software on your copier, drivers, manuals and a lot more. It'll save you money and faster shipping by buying from B and H.